On its 7th year, the UP CINEASTES' STUDIO brings the hottest films of the Cinemalaya Philippine Film Festival to the University of the Philippines, Diliman. 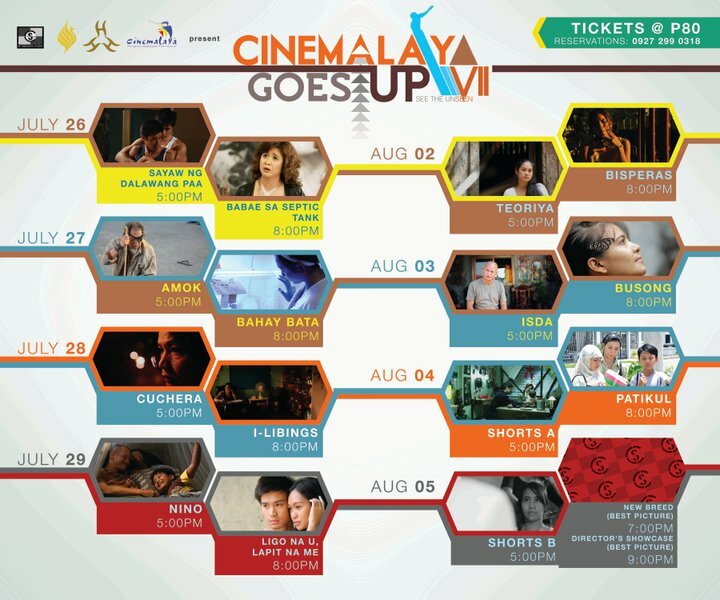 Catch these films running for two straight weeks at UP Film Center on JULY 26-29 and AUGUST 2-5, 2011. Don't miss the chance to meet the directors of these films and get the opportunity to hear them speak. They're now accepting reservations for Zombadings: Patayin sa Shokot si Remington (August 9, 2011 730pm). Ticket is priced at 100 pesos. Please place your reservations through Alex +639272990318 or Tanja +639062326535. You can claim them on August 2 & 3. 2011 at the UP Film Institute. Unclaimed tickets on those dates will have their reservations cancelled. Check FB Page of Cinemalaya Goes UP. When you reserve please include your whole name, number of tickets and contact number.